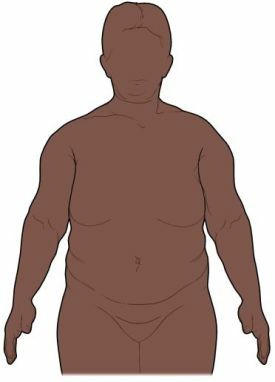 Obesity is a high amount of body fat. It leads to a much higher body weight than is normal. This level of body fat can cause serious health issues. Calories are consumed from food and drinks. They are necessary for physical activity and all basic body functions. A healthy weight is reached by balancing the number of calories you eat and the number of calories you use. Weight gain occurs when the number of calories eaten is greater than the number of calories used. If this happens regularly, it will lead to obesity. Calorie imbalances happen most often with eating too much food and low levels of physical activity. Less often, it may be caused by a medical condition or medication. Children of African American, Hispanic, and Native American descent at are greater risk of obesity. The main symptom of obesity is increased weight. The midsection is the most common area to increase in thickness. There will also be obvious areas of fat deposits all over the body. You will be asked about your child's symptoms and medical history. A physical exam will be done. Blood tests may be done to look for other conditions that may increase body weight. Other tests may be done to check for complications of obesity. These may include checking your child's blood pressure, glucose, and cholesterol levels. Personal habits, lifestyle, and family culture can all influence obesity. This means that a mix of treatment approaches is best. To help your child manage weight, encourage healthy behaviors in your child and your family. Your child may be referred to a dietitian. A dietitian can help make a diet plan for your child. The plan may include a daily calorie goal, healthy food options, and tips to change your child’s diet. Eat a diet low in saturated fat. Check food labels. Saturated fats are common in processed snacks and fried foods. Avoid trans fats. These are also common in snack foods like cookies, crackers, cakes, and donuts. Limit sugar-sweetened beverages. This includes sodas, sport drinks, and juices. Encourage your child to drink water. Switch to low- or non-fat dairy products. Limit refined carbohydrates. This includes sugars, white rice, and white bread. Eat a high-fiber diet. This includes plenty of fruits, vegetables, and whole grains. Eat a diet that is low in sodium. Pay attention to how food is prepared. Foods cooked or seasoned with high amounts of fat can quickly increase calories. Limit fast food, take-out, and dining out. Give your child healthy lunches and snacks to take to school. This may keep your child from buying unhealthy options at school. Don’t use sweets as a reward for good behavior or test scores. Think of other, more active rewards. Set a good example. Prepare healthy meals at home. Children are strongly influenced by their parents behavior. Eat together as a family. When grocery shopping, choose healthy foods. Focus on unprocessed foods. Teach your child how to make good choices in the grocery store. Teach your child about proper portion sizes. Your child may be able to continue eating favorite foods, just in smaller portion sizes. Also, cook less food at mealtime and don't bring it all to the table. Focus on healthy foods your child can eat. Don’t eliminate all sweets and treats. Overdoing this may make your child want them more. Include occasional treats in proper amounts. In more severe cases, your child may have to follow a meal plan. Encourage your child to participate in physical activity. Sign older children up for sports or activities. Develop some family-based activities that everyone can enjoy. Get at least 1 hour of physical activity every day. Limit time in front of a TV, game, or computer screen to 1-2 hours per day. If your child is under 2 years old, avoid screen time. In more severe cases, your doctor may provide a specific activity plan. A weight-loss program and active video gaming. Your child may also be referred to a therapist. This type of support may give your child insight into losing weight. Therapy that includes the whole family may also be helpful. Ask friends and family members to support your child. Time and motivation will keep your child on track. Make sure a healthy lifestyle is promoted at school or other organizations your child is involved with. Help your child to feel confident in making healthy choices even when the other children are not. Some children who are obese may already have serious conditions due to weight. This may include problems with the heart or lungs, diabetes, or bone and joint problems. These conditions may require separate treatment. Medication may assist weight loss when added to lifestyle changes, but teens need to be closely monitored for side effects. Note: Over-the-counter and herbal products that are marketed as weight loss drugs may not be effective and some may be dangerous. Talk to the doctor before your child takes any of these. Bariatric surgery may be an option for some obese teens. This surgery will change the size of the stomach. This option is generally only considered if all other options have failed. Encourage your child to eat a healthy diet. It should be rich in fruits, vegetables, and whole grains. Choose lean meats, poultry, and fish. Serve reasonable portion sizes. Eat healthy meals together as a family. Limit sugar-sweetened drinks, even fruit juices. Encourage your child to drink water. Encourage your child to get at least 60 minutes of activity most days of the week. The activity should be moderate to vigorous intensity. Ask your doctor for specific guidelines if your child is younger that 2 years old. Limit screen time to 2 hours a day. Make sure your child is getting enough sleep. Set a good example for your children. Choose healthy food options. Be physically active. Children's BMI tool for schools. Centers for Disease Control and Prevention website. Available at: http://www.cdc.gov/healthyweight/assessing/bmi/childrens%5Fbmi/tool%5Ffor%5Fschools.html. Updated May 15, 2015. Accessed March 20, 2018. NHLBI integrated guidelines for pediatric cardiovascular risk reduction. EBSCO DynaMed Plus website. Available at: http://www.dynamed.com/topics/dmp~AN~T900917/NHLBI-integrated-guidelines-for-pediatric-cardiovascular-risk-reduction. Updated February 12, 2013. Accessed March 20, 2018. Obesity in children and adolescents. EBSCO DynaMed Plus website. Available at: http://www.dynamed.com/topics/dmp~AN~T115153/Obesity-in-children-and-adolescents. Updated July 19, 2018. Accessed March 20, 2018. Obesity in children and teens. American Academy of Child and Adolescent Psychiatry website. Available at: http://www.aacap.org/AACAP/Families%5Fand%5FYouth/Facts%5Ffor%5FFamilies/Facts%5Ffor%5FFamilies%5FPages/Obesity%5FIn%5FChildren%5FAnd%5FTeens%5F79.aspx. Updated March 2011. Accessed March 20, 2018. Overweight and obesity. Kid's Health—Nemours Foundation website. Available at: http://kidshealth.org/parent/general/body/overweight%5Fobesity.html. Updated October 2016. Accessed March 20, 2018. Overweight in children. American Heart Association website. Available at: http://www.heart.org/HEARTORG/GettingHealthy/Overweight-in-Children%5FUCM%5F304054%5FArticle.jsp. Updated July 5, 2016. Accessed March 20, 2018. Tips for parents: Ideas to help children maintain a healthy weight. Centers for Disease Control and Prevention website. Available at: http://www.cdc.gov/healthyweight/children/index.html. Updated September 13, 2017. Accessed March 20, 2018. 3/6/2013 DynaMed Plus Systematic Literature Surveillance http://www.dynamed.com/topics/dmp~AN~T115153/Obesity-in-children-and-adolescents: Te Morenga L, Mallard S, et al. Dietary sugars and body weight: Systematic review and meta-analyses of randomised controlled trials and cohort studies. BMJ. 2013;346:e7492. 3/10/2014 DynaMed Plus Systematic Literature Surveillance http://www.dynamed.com/topics/dmp~AN~T115153/Obesity-in-children-and-adolescents: Trost SG, Sundal D. et al. Effects of a pediatric weight management program with and without active video games: a randomized trial. JAMA Pediatr. 2014;168(5):407-413.